Thanks for the info chickenwire that makes a lot of sense in the way you explained it as to why there is a shortage of parts. We are going to be pulling parts from recycle yards for a long time. Thanks joy . They said the part is discontinued. Did you check with Tom at crate engine depot? He can search the entire parts inventory to see if there is one lurking out there somewhere. He has found parts for me. Called engine depot & was told after a USA search none out there Rob. Thanks for the tip any way. I book marked the site. I have been phoning GM Dealerships with no results & there telling me to phone auto glass companies. Last edited by easyryderca; 04-10-2019 at 09:33 AM. This is the rubber part that goes around the edge of the glass itself? To bridge between the glass and the frame on the outside of the car? If so then yes, any windshield place will have it, and they generally refer to it as a gasket. There are are few different generics shapes for it which may or may not exactly duplicate the original. Maybe it's a coupe thing but my solstice does not have one installed, and a lot of cars built in the past 10-15 years or so won't either. As manufacturing tolerances have gotten tighter and pennies pinched harder it's been done away with. My GM Dealership finally managed to find part #20818154 from a salvage company in good shape & it wasn't cheap as the cost new was over $400 when they were available. The parts manager said the the rubber strip goes at the top were the roof lays & runs down between the two mirrors its 2.5 inches wide. This took me a few years to find & as usual a real learning curve for me as i'm light years behind in knowledge as compared to a lot on this site. He also said the rear window is still available at around $400 -$500 in Canada currency . I had no problems getting one a while ago when my windshield cracked but they may have run out since. Glad you found one and hope neither of us ever needs another! I think you all are getting parts confused. 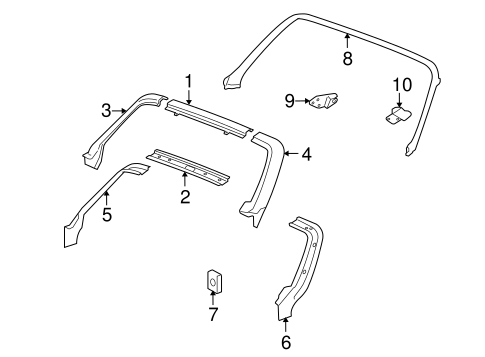 The part number in question#20818154 is the seal between the windshield header and the top. The seal around the windshield glass usually come with a new windshield and really can't be replaced without removing the windshield it self. Even though GM shows the same part number for both the Sky and Solstice (20818154) there is a slight difference between them. Image one show the discontinued part. 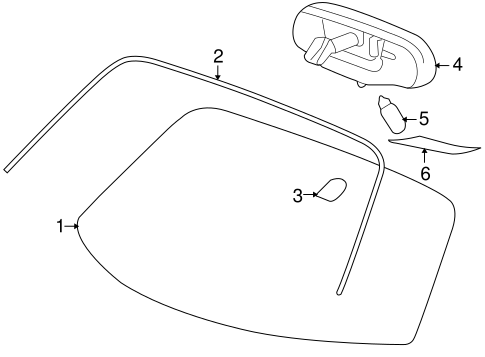 Image two shows the windshield glass seal. Thanks for the clarification Hoosier. The windshield to top seal is apparently a composite made up of three different parts. CW can explain it. Having one as a spare is a great idea. Thanks Hoosier & Rob for explaining it. What you posted was explained to me by the parts manager at my G.M. Dealership & had the pic you posted . You have no idea how many G.M. Dealerships i called in both countries that had it wrong thinking it was the seal around the windshield & that the auto glass companies would take care of it. I went around in circles on this one. Last edited by easyryderca; 04-13-2019 at 09:52 PM.